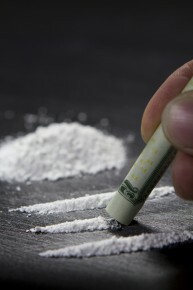 Cocaine is a stimulant that has a high risk of dependency if it is used regularly. It produces an increased alertness, a feeling of euphoria, feelings of well being, increased energy, and feelings of confidence. The high is short-lived and only lasts between 15 minutes to an hour. It can be snorted, smoked (in freebase form known as “crack”), or injected. Due to the short duration of the high, users will not want to stop using it, once they have started, in order to avoid the feelings associated with the drug wearing off. The physical withdrawal symptoms related to cocaine addiction are mild in comparison to other drugs, which may give the addict a false sense that their drug use is under control. A coke addict may even be able to go without the drug for a period of time. The psychological withdrawal, on the other hand, is much more difficult to deal with. A person who has developed a cocaine addiction may experience intense cravings for the drug that seemingly appear out of the blue for months or even years after they have quit using the drug. The answer to this question is a definite yes. An addicted individual has a much greater chance of staying clean in a rehab situation compared to being in the environment where they have been using. Environmental cues, such as places the person has bought drugs, or used them can act to trigger cravings. Cravings are the coke addict’s worst enemy, and they often start a chain reaction that ends in a relapse. As safe as rehab is, it is a place that is filled with drug addicts. There may also be circumstances where some of these addicts did not choose to come to rehab on their own. Some patients in rehab might be court ordered, or sent by their families against their will. In reality some patients may not want to quit drugs at all, and this can cause problems for everyone in the facility. If some of these patients put their mind to it, and decide they are going to figure out a way to get drugs in, the result can be disastrous for the population of the center as a whole. It should be noted that addicts trying to sneak drugs into rehab is a problem that has existed as long as rehabs themselves. The treatment centers know what they are dealing with, and most centers have good security and limit their patient’s interactions with the outside world. The power of addiction should never be underestimated though, addicts are very inventive and creative, and if there is a way to get around security they will probably find it. The answer to this question is, it depends. With information and education about what they are going through, addicts are less likely to slip up. With support and understanding of their vulnerabilities, addicts get clean and stay clean all the time. The more they know and the more support they have, the less likely they will be to use. If they are offered drugs in a treatment setting they may use their withdrawal symptoms as an excuse to use. Treatment centers have to be constantly checking for signs and behaviors that might indicate there are drugs there. The ideal situation is that they will never be offered drugs and never have to make that decision.